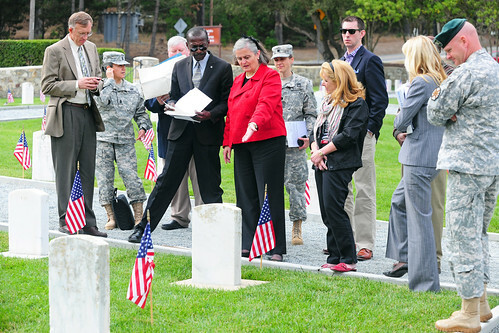 PRESIDIO OF MONTEREY, Calif. - The Presidio of Monterey Garrison Command is the steward for two historic military cemeteries, one located at the Presidio near the Taylor Gate and another located at the former Benicia Arsenal in Benicia, CA. On Oct. 9, Ms. Kathryn A. Condon, Executive Director of the Army National Cemeteries Program travelled from her headquarters in Arlington, VA to meet with Garrison leadership and take a tour of our cemetery grounds. PHOTO by Steven L. Shepard, Presidio of Monterey Public Affairs.